Our panel of Wigan Athletic experts have their say on the fall-oiut from the sale of Will Grigg, and the ‘new-look’ Latics ready to atack the rest of the season - starting this weekend at Rotherham. It’s amazing the difference a week can make for a football club. Last Friday will go down as one of the most dramatic we’ve had as a club as the fallout following Will Grigg’s move to Sunderland was fully laid bare. We’ll be discussing whether it was the right call for years to come – but I thought at the time it was a deal Latics simply had to accept. What has transpired since – the make up of the deal, how hard Latics fought for a decent price – tells me that it definitely was the right deal. Grigg will always be a Latics legend, he’s one of the best strikers we’ve ever had. 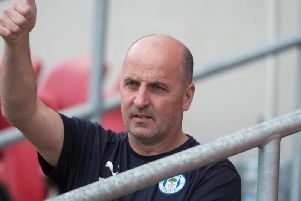 He’s been central to two amazing title winning seasons in League One and was the driving force behind Wigan Athletic reaching a historic fourth FA Cup quarter-final last season. But all good things must come to an end. Grigg has been unlucky this season. His second Championship season with Wigan Athletic has followed a similar path to his first; start of the season by scoring goals, suffer a bad injury, followed by a period of time out of the side and struggling to get back in again. We can question why Cook hasn’t played him more this season but I still maintain the club, nor the manager wanted to sell him. But when someone offers that sort of money for a player who isn’t playing, the club would have been foolish to say no. Following all that drama, and the atmosphere surrounding the club it was important that Latics got some sort of reaction on Saturday. Cook showed his intentions by throwing Danny Fox and Leon Clarke straight in to the starting line up. Leon Clarke couldn’t have hoped for a better second debut, setting up Josh Windass for the first goal and showing his predatory instinct to get that all important second goal. Danny Fox was impressive, handed the captaincy on his first start for the club and he added that steadiness at the back we’ve been missing this season. It was an important three points on Saturday, but potentially even more important will come at the New York Stadium tomorrow. We’ve a fantastic chance to get that all important second away win of the season and in the process put some real distance between us and the relegation zone. Wednesday’s Fans Forum was enlightening, it was another excellent event hosted by the club and I found it interesting to hear Darren Royle and Jonathan Jackson in terms of their plans for the club. I came away once again thinking the club was in safe hands. It was striking to hear that IEC have handed the day to day running of the club to Royle and Jackson. Let’s hope their tenure is as successful as the previous owners. I also came away feeling that Paul Cook has been unfairly treated by a section of the support this season. I still think he’ll get us out of the hole we’re currently in and with any luck we can progress next season. The past week has been an emotionally-fuelled rollercoaster, even for the standards of Wigan Athletic. Let’s start from the beginning and the departure of Will Grigg to Sunderland on Deadline Day. As a fan it is always hard to see a favourite leave, especially when he’s given so much to the club including countless wonderful memories such as firing us to two League One titles and a FA Cup quarter-final (the games against West Ham, Manchester City and Doncaster immediately spring to mind – great scenes). However, life goes on and the club must survive. The recent financial report shows how tough it is for us as a club to survive in the Championship without Premier League parachute payments. £4 million for Grigg was just too good to turn down. The main thing was that we responded as one, the board, the manager, the players and the fans... and we did. A fully deserved win over QPR where we dug in for the three points and a couple of our new signings made an immediate impact – Danny Fox and Leon Clarke. A huge victory that leaves us seven points clear of the relegation zone with important players such as Nick Powell and Gavin Massey nearing return from injury. We now have a chance to break our wretched away form and pull further clear at a vulnerable Rotherham on Saturday. Life feels good again. I’d just like to finish by thanking the club for their amazing transparency over the past week with the fans forum and allowing local media behind the scenes on Deadline Day. We are lucky to be so close to sensitive information and being able to have a better understanding of the difficult decisions (in the best interests of the club) is incredible. The new owners now have a plan in place and a business model to benefit Latics. Let’s put our trust in them and back the team to stay in this division from now until the end of the season. If we’re still a Championship club come the 2019/20 season, I’m confident we can stabilise and consolidate for future years. I am not sure what else I expected from the first transfer window under the new owners, but part of me thought they might look at our current league position and think that opening the war chest at this moment might help secure a more prosperous future and help stabilise us in the Championship. Then again, they are only just getting used to us and probably haven’t got their feet under the table and maybe, just maybe there is no war chest, but instead a small box tucked away in Euxton for emergency use only. We always assume that new owners have pots of money to spend, but in our case maybe they are just a safe and steady pair of hands right now, which to be honest is probably what we need most. But transfers excite us fans don’t they? I still vividly remember what I still consider the most outrageous signing we ever pulled off, Eamonn O’Keefe from Everton, Republic of Ireland international and willing to take a few steps down and come to Springfield Park. It was bonkers to me back then and still is now. It’s the shocks like that kind of signing that help fuel the “football transfer” phenomenon. The television shows overhype it all, it’s what entertainment is all about, but even when you take away all the spin and exaggeration, it is still an exciting time to be a fan of your team. Of course, when it goes against you it is pretty sickening. I was hoping not to have to mention the G word, but given the enormity of what Sir William brought to the club, I cannot let it pass without a few words. He really did provide us with some great moments, the fantastic goals (of which there were many), that bloody song but most of all, to me and countless others of my generation, THAT goal against them men from up near Gorton. When he latched on to Kyle Walkers step over and slotted it into that corner, I could have exploded, I still internally explode now even thinking about it. Just for what he did during those few seconds on that cold evening in 2018, Will Grigg will always be welcomed back to our club with warm applause and appreciation. Getting back to the business we did do in January, I have so say that I am pleased with the new players that were brought in, all offer something different to what we had before, all bring a new push to efforts to stay up. Olsonn should have the experience to make a difference when he is fit, which given the shuttle runs he was doing on Saturday, might be a while off yet but I have to say I am excited to see what Baningime might give us, he looks a really good and aggressive young lad – we will have a right pair in that midfield when Morsy returns. I feel we are generally going in the right direction, still not sure on the manager though, one week I am in the Cook-out camp, then the next week I am in the “yeah, well he is doing ok, given the injuries” camp… undecided at present. He is still a great chap, and I hope he can turn it around for us – that would be ideal. It’s over now for a few months, no more transfers, the players will strive and work to stay up, the fans will give the team the usual backing (good and bad) and at the end of it, we will be where we deserve to be. It’s still a hell of a lot better than the bottom of Division 4 in a crumbling old ground though isn’t it? Football is not PR but late last Thursday evening, and indeed on Friday morning, it felt that this, if nothing else, was a PR disaster. Losing Will Grigg, fans favourite and goalscoring machine, so late in the transfer window, seemed like poor football sense – especially with Latics still fighting a relegation battle – but it also seemed like a poor way for the first transfer window of the new regime to end. As has been said many times before, there is nothing to make us think that the new owners will sink lots of money into the club, indeed there are lots of reasons to think that their investment will be modest. But sometimes business investment means not buying new assets, simply keeping hold of, and making best use of, the ones that you already have. Yet the first time that IEC and the Royles have to make any sort of statement of intent, it seemed to be a negative one. Losing such a popular and successful player and not bringing in any significant permanent replacements. That said, if first viewing proves typical, the acquisition of Anthony Pilkington, Danny Fox and the second coming of Leon Clarke, seem to have improved the quality of the squad. Yet losing Grigg just leaves that sour taste in the mouth and doesn’t produce a good look. But, as I say, football is not PR. And modern football isn’t even sport. It is business. So let’s look at the Grigg deal as a business decision. Even then it is questionable. The background here became clear earlier this week when the financial results for last season were revealed. Latics lost £7.7million in a year. We know that the Whelan family sold the club because they simply couldn’t afford to keep putting in millions of pounds just to keep club standing still. The events of last Thursday night suggest that the new owners are unable or unwilling to do that either. If that is the case, then we remain a selling club. One who will have to find assets, maximise their value and sell them on at a profit. That has been the business model for some years. One of the lines coming out of the fans forum on Wednesday this week suggested that our transfer activity this summer will be to find some more long term acquisitions. From that I read: assets that we can turn into profit in years to come. In that context, £3million of guaranteed money and the possibility of it rising by another million in the future is too much to turn down surely? Well it is… except that we lose more money than that if we are relegated this season. If we go back down to League One then we will definitely lose at least £5m in revenue. This will be due to the lower ‘Solidarity’ and ‘Basic Award’ payments made to each league club by the EFL. So this is a gamble. Because whatever you think about Will Grigg – and while I think he is good enough at this level, many don’t – surely we can agree that losing him weakens our squad. You don’t have to believe that Grigg is a top Championship goalscorer to think that losing him actually reduces the chance of us staying up. Of course it will be pointed out that he hasn’t been playing. That is true – and I can’t really explain that unless it is due to his injury. But it is relevant here. There are only two reasons why a transfer happens. Either the club wants or needs to sell, or the player himself wants to go. We’re told that Latics didn’t want to sell Grigg but they couldn’t turn down the money. And without knowing what financial package Sunderland offered Grigg, certainly Paul Cook made his decision to move easier by leaving him out of the team. Nick Powell will likely leave for free in summer. We should face that fact. Therefore it can be argued that it is more important to cash in on Grigg now. But these two events are not linked. They are individual business decisions. We could end up losing Powell for nothing, being relegated and then seeing our revenue decrease by more than we brought in for Grigg. So for this to be a sound business decision, the club must believe that we have maximised the amount of money we can get for him (I agree – I think we would have got less for him in the summer – we have sold at the top of the Grigg market), and that losing him will not significantly reduce the chances of relegation. Either because he wasn’t going to play that much or because he isn’t better than our other goalscoring options. That is an interesting calculation. I stated last week that if we sold Will Grigg then we would be relegated. Certainly I am not going to change that view based upon just one game, however welcome Saturday’s win was, but I have never worried about putting predictions in writing that turn out to be wrong. I did it last year. And I certainly hope that I am wrong about this. I hope we sold Grigg for the best price we could get and then we stay up to keep our EFL payment as high as possible. No player is bigger than the club. Obviously we have to be grateful to Will for his goals which have brought us two divisional titles and an awful lot of joy. For us fans, goalscorers always have a special place in our hearts. If I am honest I am still mourning the loss of Nathan Ellington, the day after our first Premier League game. So thanks for the memories. I Will miss you. Several of your goals mean a lot to me – but for personal reasons that one against Man City is particularly special. One I will never forget.